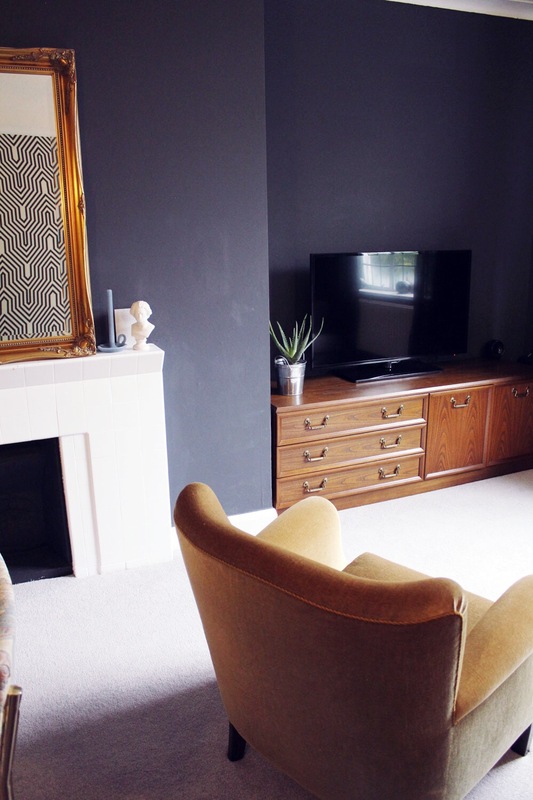 BEFORE AND AFTER: LIVING ROOM - THE BIG REVEAL! 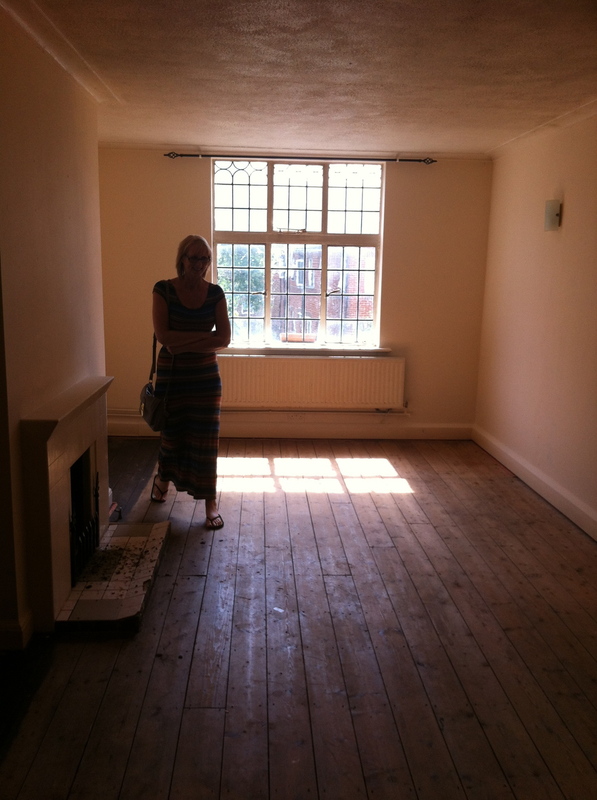 So we had the original floorboards, original fireplace (with an added on newer tiled slab at the front, gross), original doors and windows and wall lights. Unfortunately the room had that bobbly plaster type stuff on the ceiling too. The room's a great size though and it didn't need any major work, it was pretty much all decorative stuff that needed to be done. 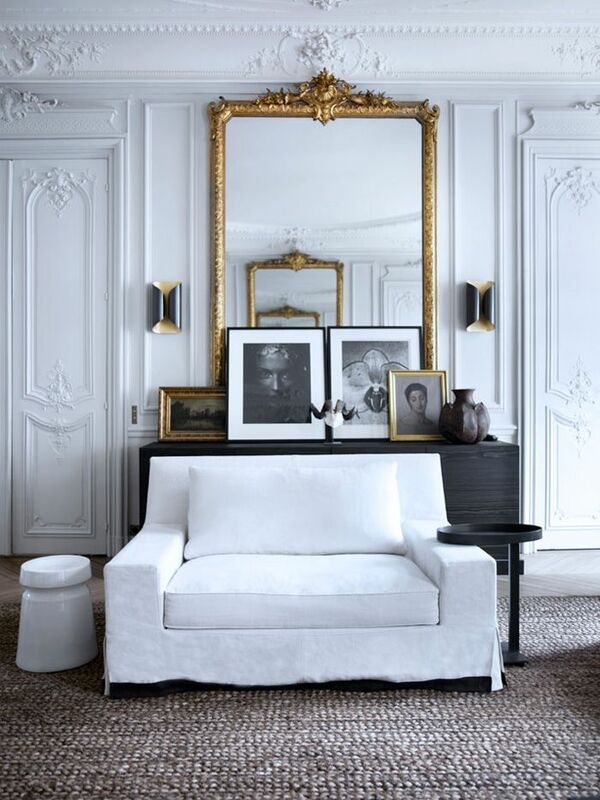 I had a few pictures that I used to inspire the room but as this was kind of before my understanding of interior design so I didn't really have a scheme per se. I knew I wanted dark grey walls and a feature wallpapered wall. Here's what I was inspired by. Ok on the surface of it three pretty different styles! 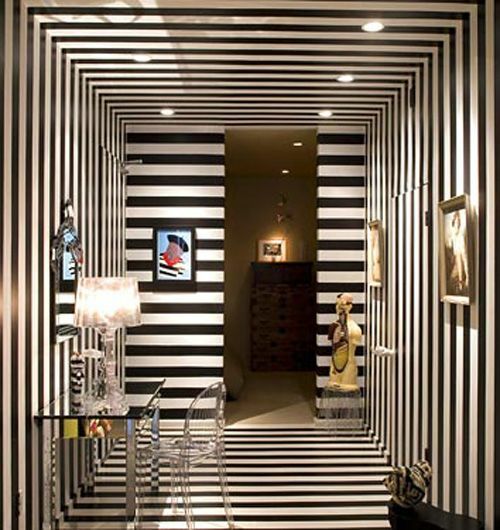 But I knew I wanted dark walls, some graphic monochrome elements, old style gilt frames and flashes of pop art and colour. 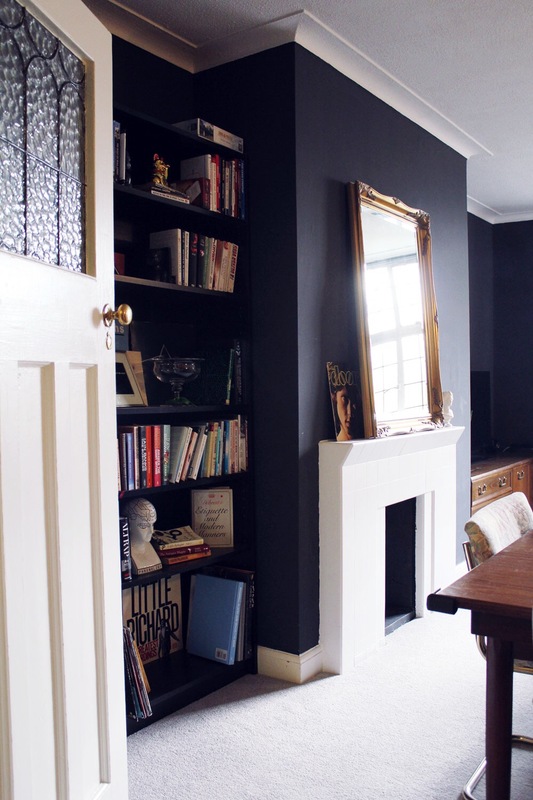 We started by painting the walls in a soft black (which is actually a dark grey) by a B&Q own brand colour but I can't find it on their website so maybe they don't do it anymore. 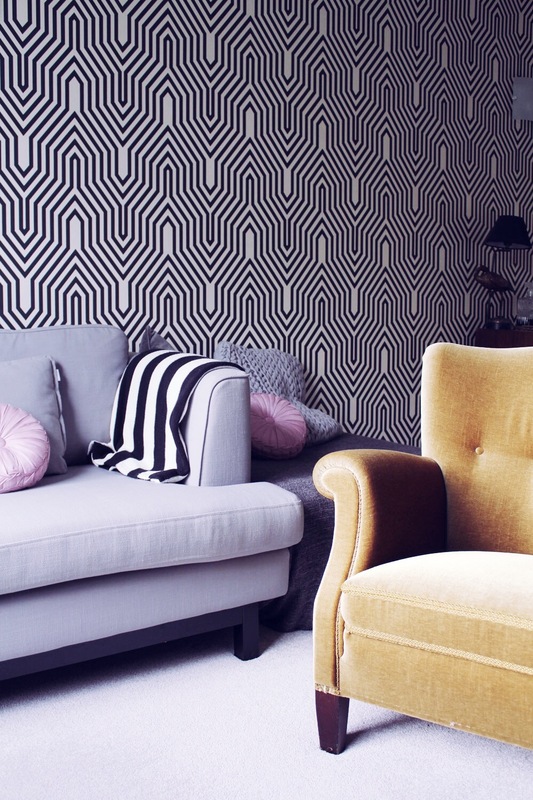 This one is very similar. . Once that was done we did our feature wall with Osborne & Little's Minaret which we ordered from Wallpaper Direct and was £67 a roll. We got 4 rolls I think and had a fair bit left over but I wanted to make sure we had more than enough as I know when pattern matching you can sometimes end up using more than you think! We then sort of shoved all of our furniture in there in a makeshift fashion so that we could at least move in. Marley was tiny at this point so we didn't really need to worry about her walking into stuff or the hurting herself on the bare floorboards as we just out down blankets for her to lie on. After a couple of months we got All Flooring UK (who is an awesome carpet fitter and floorer - give him a shout if you need someone great) to fit our soft grey carpet. The carpet we used is by Primo Plus and the colour is Misty Morning. Luckily we fitted the carpet about the same time Marley started crawling! This is the view looking into the living room. The sofa is French Connection at DFS and the model name is Flint (you can see some detailed pictures of the sofa in this blog post). 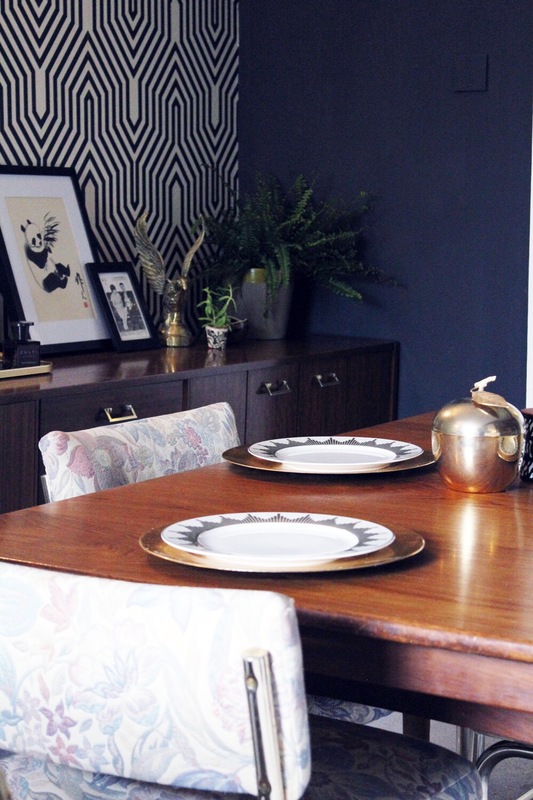 The dining table was an awesome purchase from a local charity shop for just £30! The dining chairs are a very recent eBay purchase and I'm about to reupholster them with velvet... stay tuned for that. The gilt framed mirror was given to me by my granddad and the bookshelves are the basic Ikea ones that we used to have in our rented place and brought here. The Gold charger plates are from John Lewis (they don't sell them anymore but there are some really similar ones here) and the dinner plates are from Biba. 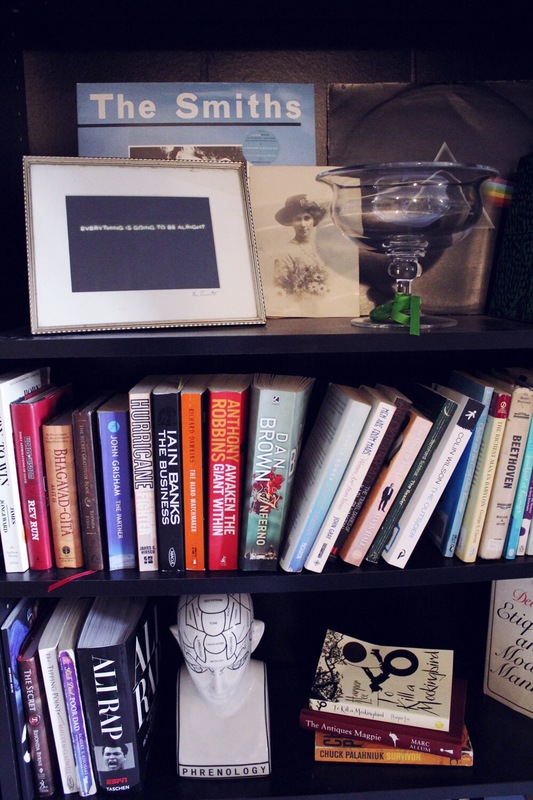 I know you're probably looking at that bookshelf thinking 'that is the most random selection of books I've ever seen!' and yeah, you'd be right! I'm not really one for the stylish selection of fashion books, but instead it's a real mix of fiction, business and self help books. Yep, that's how I get down. Haha! 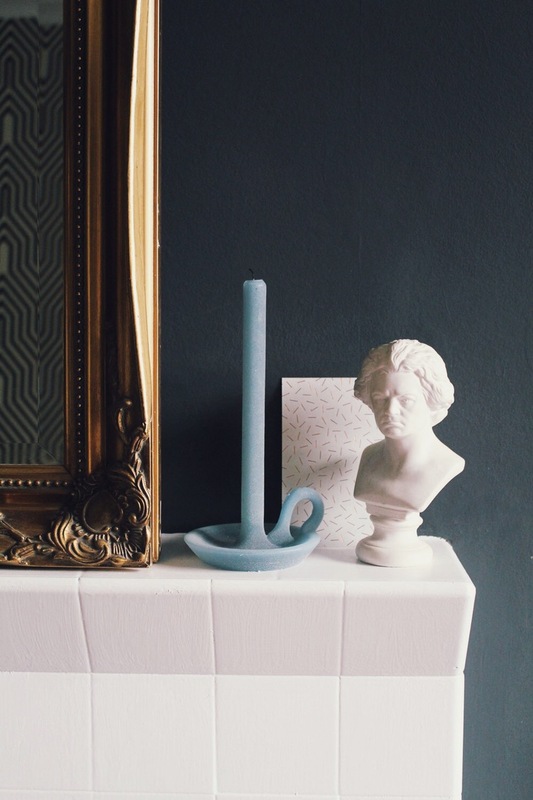 You can also see my award from The Amara Interior Blogging Awards and the Phrenology head is from Asda George. There's also a few vintage LPs and some old family photographs. 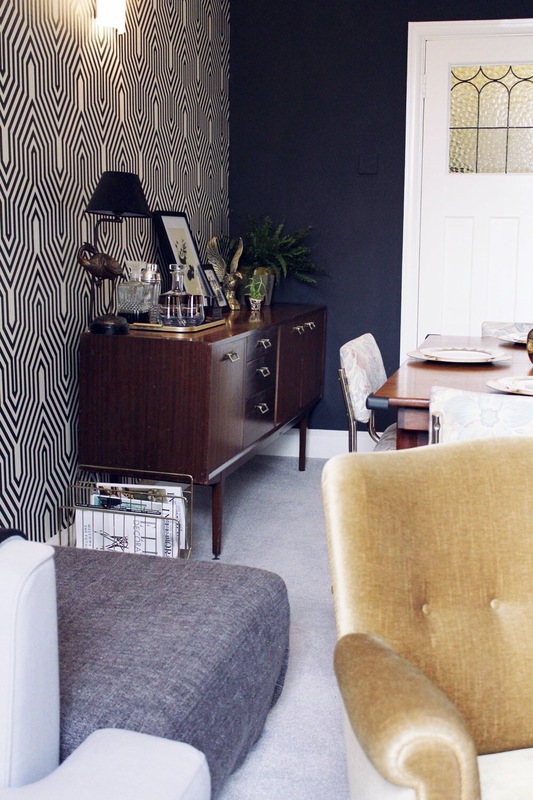 Here are some more shots of the room and the two fab sideboards that I got again from the local charity shop at just £30 each! Can you say BAR-GAIIIIN?! That brass wire magazine rack you see in the first picture was another vintage shop find for just a tenner. The armchair was another vintage shop find (do you see a recurring theme here?!) from House of Twenty and was about £350. 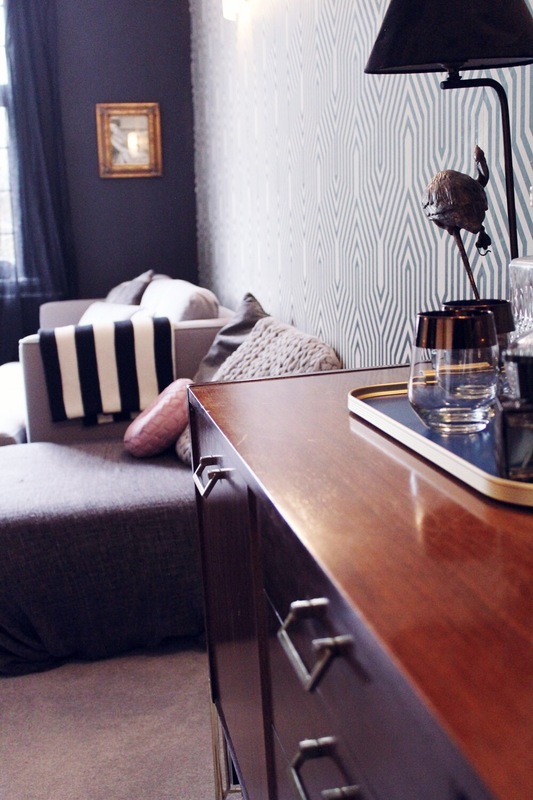 Here's a post all about our hunt for the perfect armchair if you're interested in that kinda thing! We have a few little bits left to do in this room, mainly changing the curtain pole and putting up a few more bits of art. I'd also love to put a neon sign above the TV so going to see if I can convince hubby about that one. Stay tuned to see how the dining room chairs turn out. It's going to be my first time reupholstering anything so fingers crossed! Hope you liked the living room. It's really the perfect example of my crazy taste. What do you think?